One of the things I love most about blogging is the comments. Although, when I’m spending too much time moderating spam comments, it can be tempting to think about shutting down the comments on Stonesoup. But then I go and write a post like last week, that didn’t exactly come out right. And I’m reminded of the great thing about comments – feedback. With the help of all of the fabulous Stonesoup readers who took the time to share their opinion, I could see where I had missed the mark. Which will make me a better writer in the future. And once again made me thankful for the comments function on my blog. Those of you who are worried about Stonesoup becoming a ‘food fashion’ or ‘fad diet’ blog. Thank you for your concern and for taking the time to let me know. I really do appreciate it. You’ll be happy to know I have no intention of swapping my bedside reading from cooking and food books to science or nutrition journals. I still love food and that’s what I want to share here. Stonesoup will continue to be a blog that celebrates food from the perspective of keeping things as quick and simple as possible without sacrificing flavour or healthiness. So last week, among my ‘rant’ on the perils of grains, I shared where I’m at with healthy eating. For those of you who missed it, basically I’m avoiding grains, sugar & fruit and embracing vegetables, meat, fish, legumes and a little cheese and yoghurt. That being said, ‘avoiding’ doesn’t mean completely excluding. We still have the occasional Friday night pizza session or a pasta feast. And if I come across a tray of ripe raspberries that look too good to resist, I’ll buy them and enjoy. It really is about moderation. I also mentioned how I’m happy with this way of eating because it has enabled me to enjoy my food and love my waistline. Without running super long distances to compensate for my diet. But there’s been another more personal benefit that I didn’t touch on. Years ago, I was diagnosed with Polycystic Ovaries. No big deal. It just meant I didn’t get regular periods. And that things could be a bit tricky from a fertility perspective. Again, no dramas. One of the biggest surprises for me changing my way of eating has been that I’ve started having a (relatively) regular cycle. Polycystic Ovaries no more. I’m yet to come across anyone who thinks we should be eating less veggies. For me the easiest way to do this is replace the grains in my diet with vegetables as much as possible. I’ve always been a fan of variety and am definitely someone who is always on the lookout for new things to try. So I was happy to be reminded by an email from a Stonesoup reader about the benefits of variety in our diets. Not just about stopping boredom, variety also helps to spread our risks of eating too many harmful foods OR missing out on too many essential nutrients. Regardless of your stance on eating grains and fruit, it’s important to understand the role of carbohydrates in a healthy diet. If you have any questions around this, I’d really recommend taking the time to read Why We Get Fat by Gary Taubes. One of the things I really failed at in my post last week was that I didn’t explain my belief that everyone is different. And what works for me isn’t necessarily going to be the best option for you. I totally respect everyone’s differences (and am excited about them – it would be boring if everyone was the same). I hope you’ll develop your own definition of healthy eating based on what works for you. Inspired by the grill master Francis Mallmann. The first time I made this salad I cooked the carrots on the BBQ and served it with only a little cheese as a side dish to a BBQ rib eye steak. The salad completely outshone the meat. Here I’ve upped the goats cheese to turn it into a light lunch salad. And I’m burning the carrots in a hot pan. While the results are pretty decent in the kitchen, it’s not quite as mind blowing as the BBQ version. So if you can BBQ your carrots by all means do. 1. Heat a large heavy frying pan on a very high heat for 3-4 minutes. 2. Meanwhile trim and discard carrot tops. Halve carrots lengthwise. 3. When the pan is super hot. Add a little oil and the carrots, shaking to make sure they are in a single layer. 4. 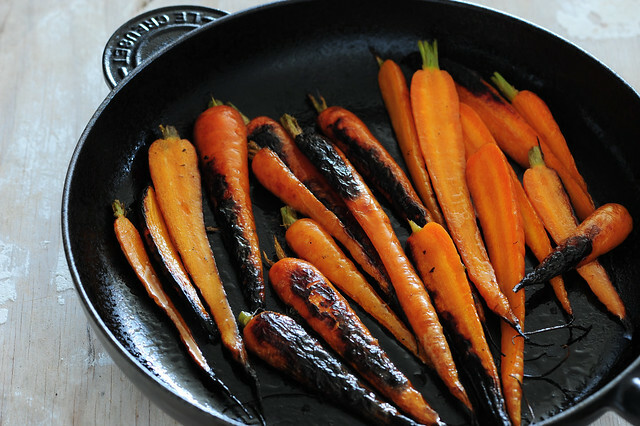 Cover and cook for 5-6 minutes or until carrots are a little burned and charred in places. 5. Meanwhile, combine balsamic, soy and 2-3 tablespoons extra virgin olive oil. 6. Turn the carrots and cook for another minute or until cooked to your liking. 7. Scatter leaves over a serving platter. Top with hot carrots, drizzle with dressing and finish with little chunks of the cheese. vegan – replace the cheese with a generous handful or two of roasted almonds or sunflower seeds. dairy-free – see the vegan option. Or try a couple of chopped boiled eggs instead of the cheese. side salad – either decrease the cheese or skip it all together and serve as a side salad to BBQ steak or chicken. 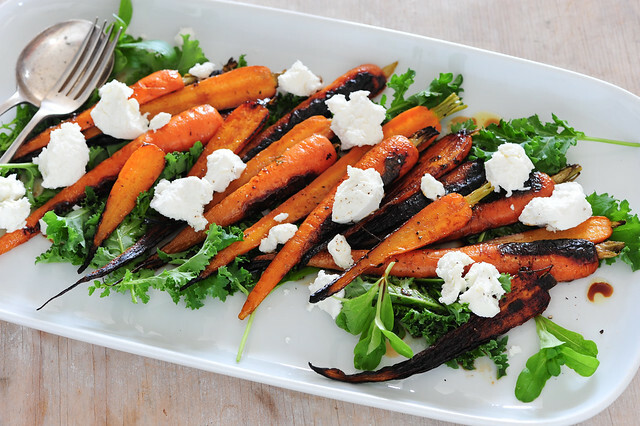 more substantial – I’m keen to try this as a carrot & lentil salad. Just toss a drained can of lentils in the dressing. Or use home cooked lentils that have been boiled in water until tender (15-20mins) and drained. carnivore – replace the cheese with shredded cooked BBQ chicken. soy-free – just skip the soy sauce in the dressing and be more generous with the salt & pepper. budget – replace the goats cheese with ricotta or another less expensive cheese. And use 5-6 regular carrots quartered lengthwise instead of the baby carrots. I tried the sample Recipe in the 5 Habits the other day (the breadcrumbs-version), and it became my favorite Dinner since. I eat it wrapped in thin bread with slices of tomato and some yogurt added into the bread – simply delicious. And I don’t feel stuffed or bloated after eating. Works fine by itself (without the breadwrap) too. This one is definitely worth a try too! I love carrots and expect the burning will add to their sweetness. It looks delicious! Good on you for sharing your story Jules. I followed a similar diet for a similar problem a few years ago – I also dropped coffee which was hard – after about 6 months my symptoms were gone (the alternate option being surgery – yukkk). Glad it is working for you too..
With some additional help from accupuncture, we overcame our fertility problems.. I just have a question… I’m vegetarian but I eat legumes and grains to have enought proteins… How do you do to have them with your diet ? No criticisms from me. You are penetrating, slowly in my case, my mind about what exactly may be not agreeing with me. Why I am so blah! I am open to change and really really appreciate the advice. Conventional medicine has failed me to a certain extent. Onwards and upwards – I will make myself as well as I can. It’s getting close to a year since I read your post about “leaky guts” and even though I was raised a vegetarian, something clicked and I gave giving up grain a go. I can’t thank you enough for being the catalyst in my paleo journey. At first I was thrilled that the 14kgs of persistent baby weight melted off but it’s gone beyond that now. My head is clearer, I’m happier, I love my body for all it’s strengths and I love my food without one ounce of guilt. I eat more vege’s now than I did as a vegetarian! Anyway there have been too many wonderful changes to mention and really all I wanted to do was thank you. I love the different variations you included at the end of this one! Thanks for all the great recipes! Thanks for your thoughtful inclusion of options with your recipes Jules. I’ll be trying this carrot recipe this week. I am still not able to get past the flash sign-up page unless I sign-up, every time. There is no place to X it out. I do not get that problem with any other subscription access blog. I’m pretty tech savvy, but I can’t get rid of it unless I sign-up, every time, although it tells me then, that I’m already signed up. Just wanted to say… I still love your blog, and I’ll always appreciate you for introducing me to balsamic mixed with soy… and eggs cooked with creamed corn. So delicious. And how could I forget, 15 minute lasagne!! Jules, I totally “got” what you were trying to say in your previous post. I have found that eating a lot of grain carbohydrates doesnt feel like a good thing for my body, and not because i’m interested in weight loss or partaking in any fad diet, I just think having reduced grain carbs makes my body feel healthier. I also think a lot of people are out of tune with their bodies and dont take the time to assess what works for them, so I can imagine that people who are trialling different combinations of nutrition appear like they are on some crash/fad diet. I guess like life we all need to learn to think for ourselves, keep an open mind and avoid following diets blindly. Question! What do you do if you’re going to exercise or do a workout of some kind and will need more energy than normal? Even without most carbs, I find it hard to give up sugar & fruit all together – especially when I’m heading to the gym and don’t want to pass out from low blood sugar. Do you have any pre-workout food suggestions? I completely agree with your eating suggestions, and roasted/blackened carrots are my absolute *favourite*! In fact, I think we may even be blog-sisters ;). I just love your blog! And I know how irritating it is to filter through the comments to remove spam. There’s a free wordpress plugin called spam free wordpress. You can install it from your dashboard. The commenters will just have to make an extra step – they have to copy and paste a captcha code -very easy! But all spammers are blocked and you won’t have to waste time on them. You’ll know how many spammers have been blocked and if you wish to view the blocked comments, you can do so. All the best, and looking forward to more stonesoup healthy and fun recipes! Hi there, have only just discovered your blog via the Blog Chicks network. Love it! I really like your philosophy and must tell you that I did a diet challenge years ago due to ill health… went grain free for 12 months and couldn’t believe the difference in my wellbeing after just three weeks! I am trying to do it again and stick to it, but finding it a little difficult. Love your blog, will visit often. My first time logging into Stonesoup was the previous post on grains and I was immediately was hooked, because of your rant! I discovered the “better way to eat, for my body” a few months ago and not only have I lost weight (I’m talking high school weight) I have more energy and feel great. Last weekend I tried the new Umami burger restaurant in SF and next weekend I will satisfy the pizza craving. It’s the “treat and cheat” weekend day. Oh…..and the carrot salad with lentils for dinner tonight. I love the budget option and hope it’s a regular feature! You might find it interesting to read up on Metabolic Syndrome. The incidence of Metabolic Syndrome is a lot higher in women with PCOS than in the general population and one of the key characteristics is a degree of insulin resistance. This may help explain you understand why the eating plan you’ve adopted has worked for you for weight loss and other measures of well-being. I’ve been lurking on your blog for maybe half a year or so — love the recipes and your writing style, but I am coming out of my shell a little bit because I wanted to thank you for sharing a bit more of your life today. I was diagnosed with PCOS last week after quite a few months of pain, confused doctors, and a misdiagnosis of pregnancy (talk about an ironic let down!). I have been gearing up to talk to my doctor about drug-free treatment options (basically diet & exercise), but it all seems pretty bewildering right now and your clarity and encouragement were a big help to me on this grey October morning. I always knew there was a reason why I love you, your site and your recipes – because they’re perfect for me! I also have PCOS (and Crohn’s Disease, just to keep things interesting!) and have struggled with the right diet for years. I am only really in the last few months making a concerted effort to eat just as you suggest – with limited grains, sugar and fruit (and meat, but that’s a personal choice – just means I have to work harder on the protein front). I just have one question that I’m hoping you could help me with…… what do you do for breakfast? It’s so geared towards grains and fruit that I struggle to find appropriate foods for breakfast. On weekends when I have more time I will always cook up eggs and veggies, but during the week I rarely have time for a cooked breakfast. What do you do? Any helpful suggestions? Thanks for sharing your passions and your story. My sister also has Polycystic Ovaries. Ill definitely pass your blog onto her to enjoy. This looks so great!! Would be super yummy and nutritious using purple carrots also. just wanna tell you that I LOVE YOUR BLOG!!! Just wanted to say I have just enjoyed a lovely bowl of burnt carrot salad, the more burnt the more delicious! I have recently been experimenting with cutting out bread to combat mid week bloating, and am enjoying the alternatives with minimal bloating. Thanks for all your great recipes, keep in the good work!!! P.S. Love the Egg Plant Steaks too!!! Jules—- this salad looks absolutely delicious and beautiful! I would have never thought to BBQ carrots. Thanks for the creative and yummy inspirations, I can’t wait to try this one out. Also I love-love-love the video versions of your recipes! Keep’em coming! thanks for sharing your story, jules. i have PCOS too and i try to manage it w healthy diet. i’ve found including a little bit (tbsp) of virgin/cold-pressed coconut oil in my diet daily works better than any medication at managing a lot of the symptoms (blood tests prove it too!!). i’m wondering: did you lose weight or see a reduction in symptoms when you left grains behind? i love your blog — i read it all the time. thanks for all the encouragement to explore the simple flavors of food w/o all the “clutter”. right now i’m living in the states where it seems every vegetable comes with its own dipping sauce. gone is the appreciation for the taste of food itself. i have learned so many great ideas from your recipes — you’re such an encouragement in that way. keep it up!! i too love your blog. just wondering if you have ever done a post about what your typical meals are like through the week. i’m trying so hard to cut the grains too because i feel a lot better when i don’t eat them. i love your ideas of quick and simple and healthy meals and i would love to hear how you put it all together through the week. thank you! Thanks for posting this as well as your previous post about going low grain – I disagree with the commenters who claimed you were endorsing a “fad” diet – I think you were really clear that it was what was working for you and that you were encouraging moderation. One of the reasons I follow your blog is for the gluten free and vegetarian options and the variations you include on the recipes. Gluten free recipes are often cumbersome with too many ingredients and too many steps, and I love how simple you make it! You are such an accomodating writer. You have everything for everyone. I can definitely agree with you on your views on moderation. In fact, I think if everyone practices moderation in everything, it’ll be a balanced and peaceful world…Hmm…Yeah I guess, that is another blog in the making…LOL! LOve your recipe! Carrot has anti-cancer properties, improves skin, eyesight…What more could you ask for? Thanks for posting! Having moved to a farm with fruit trees and blackberry bushes, I have come to realize one thing about fruit: it’s not often eaten. You get maybe three or four months of fruit and that’s it. So really, if you eat in-season, there’s a type of moderation that comes naturally. I’m happy to see that others are burning their carrots and loving them too! The natural sweetness comes out and they are truly divine. I actually just used carrots in my cupcakes! They were healthy and some of the best cupcakes ever! Thanks for sharing. just catching up on your posts – always enjoy your lists and your thought – I really like the idea of including variations for your recipes – I think of your minimalist ethos occasionally on the odd occasion that I make a dish with 5 ingredients or less – did it on the weekend with spinach, eggs, flour and salt – excellent! I just made this dish tonight for dinner. I opted out of the greens because all the other dishes in my dinner were vegetables. I made it with local dill goat cheese. This has to be one of my new favorite dishes! I usually hate any form of cooked carrots as well as soy sauce. But this was amazing, I ate so many carrots. Love your blog Jules! Thank you for the wonderful inspiration! I finally made this salad tonight. Its been in my pinterest que for awhile. I used toasted sesame oil in the dressing since I figured it would go nice with the soy sauce. Oh. my. goodness. It was delicious. Thank you! I came across your site for the first time tonight (thanks to pinterest!) I also have PCOS and have been on a low carb high fat diet for 2+ yrs. Lost about 50 lbs but more importantly, I feel better! Best wishes to you and please keep the recipes coming! I made this for Thanksgiving and it was such a hit it was requested for Christmas dinner as well. I then had to send the link to everyone at the table so they could make it. Thanks! So simple and delicious. No I haven’t rh… Too tricky for me! Hi, I happened upon Stonesoup by accident. I really like this site a lot. I am a nurse practitioner but more important I am a person with eating issues. I am a cancer survivor. I work 60+ hours a week and have tended to eat junk food because of my hours and that I am so very tired all of the time. Stone soup resources are in the process of saving me from all of that. THANK YOU!